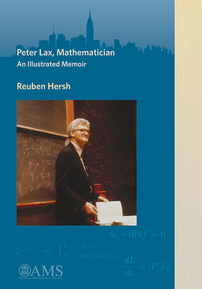 Hersh's memoir of Peter Lax is a revealing glimpse into the life, times, and work of one of the giants of mathematics. The story, told through reminiscences and interviews with Lax himself, his family, and his close friends, is the story of mathematics and its relationships to science and society from the Second World War to the end of the century. This book is a biography of one of the most famous and influential living mathematicians, Peter Lax. He is virtually unique as a preeminent leader in both pure and applied mathematics, fields which are often seen as competing and incompatible. Although he has been an academic for all of his adult life, his biography is not without drama and tragedy. Lax and his family barely escaped to the U.S. from Budapest before the Holocaust descended. He was one of the youngest scientists to work on the Manhattan Project. He played a leading role in coping with the infamous “kidnapping” of the NYU mathematics department's computer, in 1970. The list of topics in which Lax made fundamental and long-lasting contributions is remarkable: scattering theory, solitons, shock waves, and even classical analysis, to name a few. His work has been honored many times, including the Abel Prize in 2005. The book concludes with an account of his most important mathematical contributions, made accessible without heavy prerequisites. Reuben Hersh has written extensively on mathematics. His book with Philip Davis, The Mathematical Experience, won the National Book Award in science. Hersh is emeritus professor of mathematics at the University of New Mexico. Undergraduate students, graduate students, and research mathematicians interested in the history of mathematics, PDEs, applied mathematics, pure mathematics, the Courant Institute, and the Manhattan Project. This is a charming but quirky amalgam of biography, memoir and reminiscence about the renowned mathematician Peter Lax written by Reuben Hersh, Lax's friend and former Ph.D. student. The author says further that Lax unites two great traditions of modern mathematics: the first, a special style of functional analysis from Europe, and, the second, an approach to machine computation and numerical analysis via Los Alamos. Even this doesn't capture his breadth, one that ranges from shock waves, solitons and scattering theory to Lax pairs, integrable systems and the axiomatic treatment of hyperbolicity. The book is not all about mathematics. We also learn a good deal about Lax's personal life, his family and his interests — which include a serious interest in painting. There is a very nice collection of photographs (something that AMS has been doing very well in this and similar publications). Some of the most interesting parts of the book describe Lax's life at NYU over the last several decades. The book is a true blend of the personal and the mathematical. Reuben Hersh, a former student of Peter Lax, has produced a wonderful account of the life and career of this remarkable man. The book is well researched and full of interesting facts, yet light-hearted and lively. It is very well written. A nice feature is the abundance of photographs, not only of Peter Lax and his family, but also of colleagues and students. Although written for mathematicians, the book will have wider appeal. Highly recommended. This is a fascinating and beautifully written book about one of the most influential and inspirational mathematicians of the past 70 years. The author not only captures the essence of Peter Lax and those around him, but also gives the reader a feel for a glorious and exciting time in history of mathematics, that is, the era of postwar development of the Courant Institute and its brand of pure and applied mathematics. Peter Lax is a mathematician with a fascinating life history and a spectacularly successful professional career at the Courant Institute of Mathematical Sciences. Reuben Hersh, one of Peter's many students, gives us a lively and beautifully illustrated biography. This book brings out both the personal and professional aspects of Peter's work in a captivating manner. It is a great read for people who know Peter as well as for those who do not.